I Googled "Don't be a douche", found this picture, posted it, went back to the image to find the page where it is hosted, and the title of its post is "Don't be a douche" and I didn't even know. Hilarious! This made me laugh. Really. 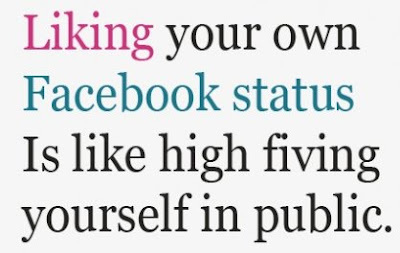 I have "liked" my own status after someone else has, as if to let the person know "thanks for liking", and now all that's left for me to do is high-five myself in public. Tsk. I am guilty of such "douchiness"...and it is cracking me up!